Sometimes a photo can say more than all the words in the world. 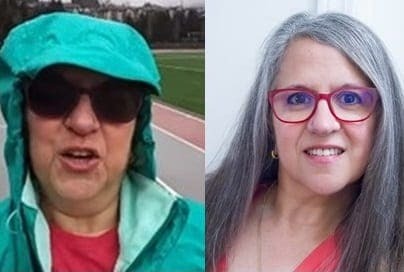 The two photos below are a comparison of me 11 months ago and today. I certainly haven’t “arrived”, but like any journey there are markers along the way – markers that you are headed in the right direction, markers as to how far you’ve come and markers as to how far you’ve left to go. This photo is such a marker. Everybody’s road to better health is different and “A Dietitian’s Journey” tells mine. You can read my story from the beginning with all the ‘gory details’ – from my “fat pictures”, to my lab work, and everything in between. It tells the story of my struggle with denial and how the pain of remaining the same was greater than the pain of changing, and so I changed. I keep making small, corrective changes in my path to ensure that it time I arrive at my ‘destination’ – which for me is to have a waist circumference (in inches) that is half my height (in inches). This is not an arbitrary goal based on vanity, but is based on me having the lowest risk of cardiovascular events (heart attack and stroke), given my lab work continues to improve, as time goes on. A summary of where I am on this journey now is here. If you have questions as to how I could help you achieve your own health and nutrition goals, please send me a note using the “Contact Me” form on the tab above.